The most interesting part of this story, is that David Fanning didn't know how to make a corset when he started out. He merely saw a gap in the market, practiced and practiced, with the help of female assistants who modelled his fledgling designs, and before long, he erected his very own factory - The Royal Worcester Corset Company became one of the two leading corset manufacturers for the mass market in the world. 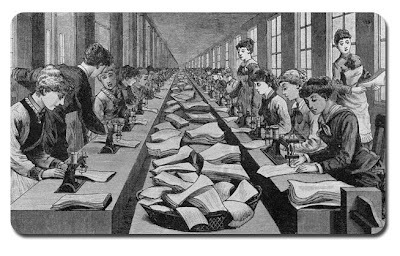 In 1898, the Company published a commemorative booklet which detailed it's method of manufacture from the moment the order was received in the factory. Many fabrics were used in the manufacture of corsets at RWCC, principally coutil, a firmly woven fabric, the finest of which was made in France. Sateen and jean from America was also used, as well as silk, satin and batistes from Italy and nettings for summer corsets. In all cases whatever colour the outer fabric was, a white lining was required as women preferred the clean effect of this next to their body. The order began it's journey in the order office, where it was given a style number. This number was attached to each piece of corset as it was processed and kept in place until the finished item was boxed. The pattern for the appropriate corset was selected from the many on the pattern rack, laid out on the correct grain of fabric and cut by the most experienced of cutters to ensure economy and best fit. The peices of the corset were then tied together in bundles and sent to the main stitching room where the seaming, basting, making up of fronts and backs and 'stripping' was done. Stripping was the process of attaching bone casings. From here, the corset was sent to the boning department where the bones were inserted by hand - bones were selected according to the type of corset, stout bird feathers being preferred by the wealthy ladies, steel bones for cheaper corsets - they were prone to rust in those days! Rattan or cane was used to bone the very cheapest corsets. 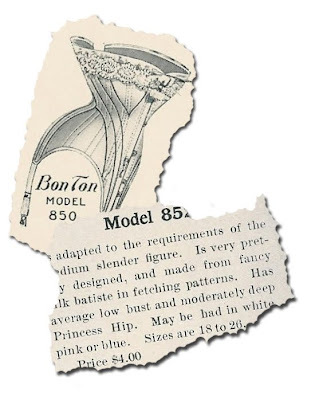 From the boning room, the corset went to the trimming room where it was put through a shaping machine, unevenness at the top and bottom was trimmed off and the top and bottom edges were bound. Eyelets were then added, along with some flossing which not only added to the beauty of the corset, but prevented the bones from working their way up or down their casings or wearing through to the front. The final stage of factory corset manufacture was the finishing whereby the corset would be sprayed on the inside with a solution of cold water starch and then tied to a 'copper maiden' through which live steam was passed, thereby pressing the final corset into shape and eliminating wrinkles. The corset was then rolled and boxed ready for shipment.